I craned my neck so much that I nearly swerved off the road. As I drove north past some cloud cover, it became clearer and clearer that a little sliver of the moon was shining through from behind a dark disk…and that sliver was slowly growing larger. I was compelled to keep looking. I knew this eclipse was coming, but had been fuzzy on the details of when it would occur. How fortunate that I should be awake and be reminded at just the moment I could see it happen. I felt there might be a message in it for me. I considered skipping class so I could continue to watch its transformation, but my Type A personality got the better of me, and I was soon inside doing the studio doing down dogs and chattarungas. I rushed out of class 90 minutes later, frantically searching for the last vestiges of the blue moon. Sunrise had begun to brighten the sky. I continued my frenzied pursuit of the pale orb, and yet, it was nowhere to be seen. 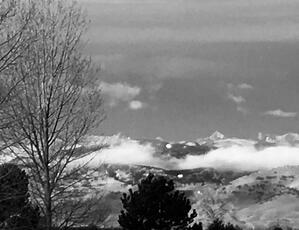 All I could see were dense grey clouds swaddling the base of the peaks and the foothills in the distance. Above the grey blanket, Mount Audubon sparkled, its shoulders embraced by a clear blue-grey sky. Wow, it was beautiful. I stopped myself from seeking the moon and dropped into the beauty that was now presented to me. It occurred to me that perhaps the moon and the sun had conspired to create this magnificent sky. I realized that I almost missed the scene before me, because I was looking for the thing that was no longer there, instead of seeing what actually was. In my desire to hold onto the magic of the eclipse, I lost my connection to the magnificence and the possibility of the present moment. This made me wonder, how else do I spend energy chasing circumstances that are no longer present? How about you? Where do you disengage from the here and now? To what end? If there was a special message for me in this event, I think it would be this: Be here now, enjoy the gift of the present moment.